Keeping your vehicles and plant safe from thieves can be a worry. More so if your vehicle is unique or eye-catching. If your property is empty and/or in a quiet location, it could certainly be targeted as many people have found out to their cost. Vehicle theft can be a major problem. For one particular gentleman, Dominic, it was causing sleepless nights. Dominic’s classic HQ Holden was stored in a lock-up garage that he had always considered safe. Until thieves broke into a neighbour’s property that is. If someone could happen there, why not at his property? Not sure what to do, Dominic got in touch to see what SHUG could suggest. Clearly, Dominic needed to be able to drive in and out of his garage, while preventing others from doing likewise. Permanent bollards work in many situations, but obviously not this one, so SHUG recommended a set of Removable Bollards. 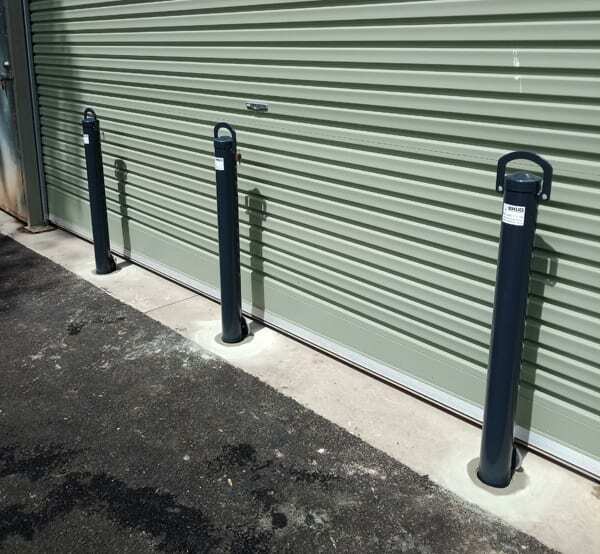 Along the front of the garage door, SHUG installed three removable bollards. When Dominic needs to drive his vehicle(s) into or out of the garage, he can remove one or more of the bollards easily. Vitally, Dominic can lock the bollards in place quickly and efficiently to prevent anyone from removing a vehicle without consent. Dominic had the option to install them himself but decided that SHUG’s installation service was the best option. Another neat and tidy job from SHUG Bollards! Since then, Dominic has been sleeping like a baby. The Holden is safe. Are you at risk of vehicle theft? Do you have property that you would like to protect? SHUG Bollards can help. Contact SHUG today for your free, no-obligation quote.